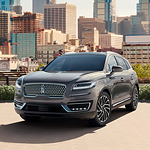 The available enhanced active park assist feature uses ultrasonic sensors to locate parking spots and assist the Lincoln Nautilus to steer into place. Parking and reversing is a breeze with the perpendicular park assist. The innovative park out assist helps to get out of even the tightest parallel parking spots. The shifter buttons give the driver ultimate control over the parking positioning.